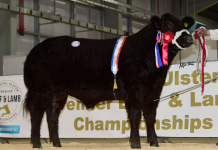 Limousin bulls met with a spectacular demand and a storming trade at the British Limousin Cattle Society’s early spring sale held at Borderway Mart on Saturday 17th February. 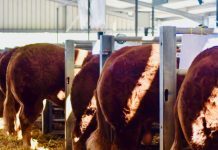 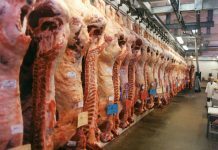 Commercial producers were out in force and were in the market to buy what took their fancy as were pedigree buyers in equal measure. 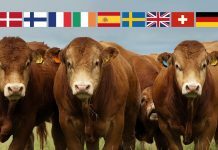 An astonishing 20 bulls made five figures or more and 59 in all sold for 5000gns and over. 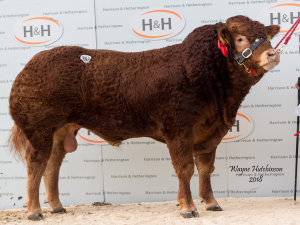 Underlining just how strong the demand was, the overall average was a mighty £7540 for the 104 bulls sold, up £871 on the year. 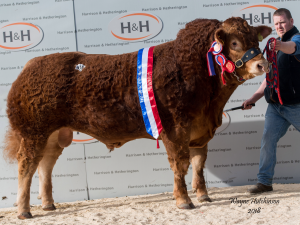 In a particular strong junior section, the average for the 28 bulls was an outstanding £10,834. 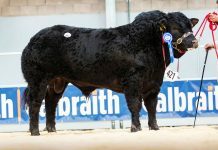 Leading the days trade was the crowd pleaser Aultside Meanmachine from Garry Patterson, Aultmore, Keith. 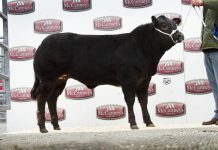 This smart bull had been placed as Supreme Champion in the pre-sale show by Judge Colin Phillips of the Powerhouse Herd. 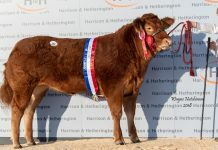 No stranger to success Meanmachine had won the Senior Limousin Championship and Overall Senior Continental Championship at Stars of the Future Calf Show last year. 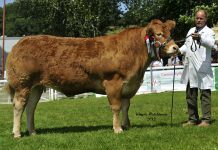 By Wilodge Cerberus out of Spittalton Flush the August 2016 born bull is a full brother to 55000gns Aultside Hulk, Intermediate Champion and top priced bull at Carlisle in May 2014. 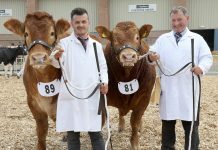 Purchasing the top price in a two way split was Messrs Ridley, Haltcliffe, Wigton along with Gary Swindlehurst on behalf of Proctors Farm, Clitheroe.